The Business Valuation Model Excel combines relative indicators for future performance with basic financial data to value any business. 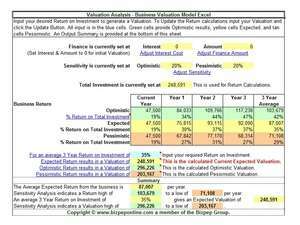 This valuation method can be used for business purchase, sale, or establishment. The model uniquely applies your intuitive business and market knowledge to provide a 3 year forecast with sensitivity analysis, investment return, and a business valuation. Outputs include a 3 year performance forecast with the ability to apply Sensitivity Analysis and produce Optimistic, Expected and Pessimistic forecasts. Business Valuation Model Excel 60 is a shareware program and can be used as a demo to try the software until the free trial period has ended. A full version of the program is available after the trial period ends. For security reasons, you should also check out the Business Valuation Model Excel download at LO4D.com which includes virus and malware tests. Additional screenshots of this application download may be available, too. Business Valuation Model Excel has a presence on social networks.